A, Adjusted odds ratios (AORs) of a nonzero Clinician-Administered PTSD Scale score at visit 2 (CAPS2) associated with 1-SD increases in the indicated variables. B, Adjusted fold changes in CAPS2 associated with 1-SD increases in the indicated variables. Data in A and B are from the zero-inflated negative binomial regression (ZINBR) model summarized in Table 2. C, The AORs of nonzero CAPS2 by baseline plasma CRP concentration category (reference category, ≤1; to convert to nanomoles per liter, multiply by 9.524), as determined by ZINBR and adjusted for the same covariates as the model in Table 2. CAPS0 indicates Clinician-Administered PTSD Scale at visit 0 (baseline); CES, Combat Exposure Scale; and PBE, Post-battle Experiences. Error bars delineate 95% CIs; the y-axes use a log scale. All P values are 2-tailed. A, Adjusted odds ratios (AORs) of posttraumatic stress disorder (PTSD) at visit 2 associated with 1-SD increases in the indicated variables. Data are from the binomial logistic regression model summarized in Table 3. The y-axis uses a log scale. B, Baseline plasma CRP concentration of participants without or with PTSD at visit 2, adjusted for the same covariates as the logistic regression model in Table 3. CAPS0 indicates Clinician-Administered PTSD Scale at visit 0 (baseline); CES, Combat Exposure Scale; PBE, Post-battle Experiences. Error bars delineate 95% CIs. All P values are 2-tailed. Importance Posttraumatic stress disorder (PTSD) has been associated in cross-sectional studies with peripheral inflammation. It is not known whether this observed association is the result of PTSD predisposing to inflammation (as sometimes postulated) or to inflammation predisposing to PTSD. Objective To determine whether plasma concentration of the inflammatory marker C-reactive protein (CRP) helps predict PTSD symptoms. Design, Setting, and Participants The Marine Resiliency Study, a prospective study of approximately 2600 war zone–deployed Marines, evaluated PTSD symptoms and various physiological and psychological parameters before deployment and at approximately 3 and 6 months following a 7-month deployment. Participants were recruited from 4 all-male infantry battalions imminently deploying to a war zone. Participation was requested of 2978 individuals; 2610 people (87.6%) consented and 2555 (85.8%) were included in the present analysis. Postdeployment data on combat-related trauma were included for 2208 participants (86.4% of the 2555 included) and on PTSD symptoms at 3 and 6 months after deployment for 1861 (72.8%) and 1617 (63.3%) participants, respectively. Main Outcomes and Measures Severity of PTSD symptoms 3 months after deployment assessed by the Clinician-Administered PTSD Scale (CAPS). Results We determined the effects of baseline plasma CRP concentration on postdeployment CAPS using zero-inflated negative binomial regression (ZINBR), a procedure designed for distributions, such as CAPS in this study, that have an excess of zeroes in addition to being positively skewed. Adjusting for the baseline CAPS score, trauma exposure, and other relevant covariates, we found baseline plasma CRP concentration to be a highly significant overall predictor of postdeployment CAPS scores (P = .002): each 10-fold increment in CRP concentration was associated with an odds ratio of nonzero outcome (presence vs absence of any PTSD symptoms) of 1.51 (95% CI, 1.15-1.97; P = .003) and a fold increase in outcome with a nonzero value (extent of symptoms when present) of 1.06 (95% CI, 0.99-1.14; P = .09). Conclusions and Relevance A marker of peripheral inflammation, plasma CRP may be prospectively associated with PTSD symptom emergence, suggesting that inflammation may predispose to PTSD. It is plausible that the observed association between PTSD and inflammation is due to PTSD-related stress hormone dysregulation leading to alterations in immune, and therefore inflammatory, signaling.7,25-27 However, given the cross-sectional nature of the evidence at hand, it remains possible that rather than PTSD promoting inflammation, inflammation places individuals at heightened risk for developing PTSD in the setting of trauma. In other words, the direction of causality runs from inflammation to PTSD rather than from PTSD to inflammation. Service members serving in the Iraq and Afghanistan conflicts endure substantial combat stress and consequent PTSD.28 The Marine Resiliency Study (MRS) is a prospective field study of approximately 2600 Marines and sailors deployed to Iraq or Afghanistan, during which PTSD severity and various physiological and psychological parameters were determined predeployment and postdeployment, affording an outstanding opportunity to investigate the causal relationship between inflammation and PTSD. In the present study, we determined whether baseline peripheral inflammation, assessed by plasma CRP levels in the MRS, contributes to postdeployment PTSD symptoms, assessed by scores on the Clinician-Administered PTSD Scale (CAPS), adjusting for trauma exposure and other relevant covariates. The MRS is a prospective longitudinal study of biological and neuropsychological modulators of combat stress–related PTSD in Marines.29 Approval was received and has been maintained since August 2007 from the institutional review boards of the University of California, San Diego, Veterans Affairs San Diego Research Service, and Naval Health Research Center. Participants were recruited from 4 all-male infantry battalions that were imminently deploying to a war zone. Participation was requested of 2978 individuals, of whom 2610 (87.6%) provided written informed consent and were enrolled and given financial compensation. Assessment of the participants began on July 14, 2008, and continued through May 24, 2012. Fifty-five of the enrollees were excluded from the present analysis because they did not deploy with their cohort or withdrew before completing the predeployment visit, so that the number of participants included was 2555 (85.8%). The demographics of these individuals are summarized in Table 1. Data were collected approximately 1 month before a 7-month deployment (baseline; visit 0) and at 1 week, 3 months, and 6 months following the deployment (visits 1, 2, and 3, respectively). Among the 2555 included participants, baseline plasma CRP concentrations were included from 2484 participants (97.2%) and baseline CAPS scores from 2533 participants (99.1%). For the other specific baseline variables used in the present statistical analyses (anthropometrics, psychometrics, and demographics; see below), the number of individuals with included data ranged from 2482 to 2548 (97.1%-99.7%). Data on deployment-related trauma were obtained at visit 1 and were included from 2208 participants (86.4%), visit 2 CAPS scores from 1861 participants (72.8%), and visit 3 CAPS scores from 1617 participants (63.3%). The CAPS,30 a criterion standard PTSD symptom scale, was the primary outcome measure for our analyses because, as a 136-point numeric scale, it would be expected to yield greater discriminant power than the binary outcome of PTSD diagnosis. Trauma exposure occurring during combat was assessed with the Deployment Risk and Resilience Inventory Combat Exposure Scale (CES) (http://www.ptsd.va.gov/professional/assessment/te-measures/ces.asp), and exposure occurring in the aftermath of combat with the Deployment Risk and Resilience Inventory Post-battle Experiences (PBE) scale (http://www.ptsd.va.gov/professional/assessment/deployment/exposure-aftermath-battle.asp). Baseline high-sensitive CRP plasma levels were measured using an enzyme-linked immunosorbent assay (ALPCO Diagnostics). Measures for variables not included in the final regression model are described in the Supplement (eMethods). The association of our predictors of interest with CAPS was determined using zero-inflated negative binomial regression (ZINBR). A description of this method and the rationale for its choice are in the Supplement (eMethods). Potential confounders were selected for inclusion in regression modeling on the basis of their univariate association at a lenient significance threshold (P < .20), with both the outcome (postdeployment CAPS) and the predictor of interest (plasma CRP concentration) (determined by analysis of variance, linear regression, or ZINBR as appropriate). The values for plasma CRP concentrations were skewed and were therefore log transformed before analyses. Ordinal and binomial logistic regression were used to determine the effects of the same predictors as in the final ZINBR model (Table 2) on the categorical outcomes at visit 2 of full PTSD (as defined in the DSM-IV-R),31 partial PTSD,32-34 or no PTSD. Statistical analyses were performed with either SPSS, version 20.0 (IBM) or, for ZINBR, the R statistical package (http://cran.r-project.org). All P values reported are 2-tailed. Baseline and postdeployment values of participants for the variables included in the statistical models are listed in Table 1 along with selected additional characteristics. 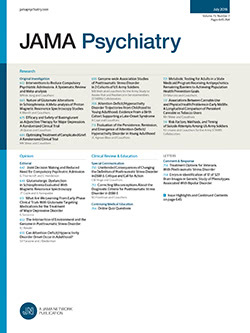 Posttraumatic stress disorder symptoms, assessed by CAPS scores (see the Methods section), increased significantly between the baseline and 3-month postdeployment visits used for our analysis (visits 0 and 2), and then trended back toward baseline in line with findings in a recent systematic review.35 In contrast to their scores on CAPS, participants’ scores on the Beck Anxiety Inventory and Beck Depression Inventory (Supplement [eMethods]) dropped markedly after completion of deployment (Table 1), potentially reflecting the relief experienced by service personnel on return from combat. Thus, the observed postdeployment increases in PTSD symptoms were not attributable to broad psychopathology or general psychological distress. We included baseline CAPS scores (CAPS0) as a covariate in all statistical analyses of the outcome of visit 2 CAPS (CAPS2) so as to adjust for any differences between participants in CAPS2 that were attributable to preexisting differences in CAPS0; this also adjusted for any effects of baseline PTSD symptoms on the subsequent trajectory of the disorder. In addition to CAPS0, CES and PBE scores (determined at visit 1 immediately following deployment) were included as covariates in regression models to adjust for differences between participants in traumatic exposure during and after combat, respectively (as detailed in the Methods section). Moreover, because the 4 MRS battalions differed from one another in their war zone experiences and in the timing of their training regimen relative to the period of data collection, cohort assignment of each participant was set as a factor in regression analysis. Multiple other potential confounders were evaluated, including several previously associated with both PTSD and peripheral inflammation (eg, baseline depression, anxiety, and alcohol and tobacco use36-52) and various anthropometric and demographic variables (Table 1); however, none met the criteria for inclusion in the regression models. In accordance with the analyses described above, our ZINBR model (described in the Methods section) of CAPS2 comprised plasma CRP concentration, CAPS0, cohort assignment, and CES and PBE scores. C-reactive protein was a highly significant overall predictor of CAPS2 in this model (P = .002 by likelihood ratio test), as was each of the other predictors (Table 2). C-reactive protein was also a highly significant predictor in the analogous linear regression model with the same covariates (P = .002); however, ZINBR is significantly superior to linear regression when modeling the outcome of CAPS (Supplement [eMethods]). We assessed all 2-way interactions with CRP; none was statistically significant. Based on analysis of the scores on CAPS subscales, the greatest effect of CRP appeared to be in the domain of hyperarousal (subscale D of CAPS; overall P < .001), with less of an effect on numbing (subscale CN; P = .03), and even lesser effects on reexperiencing (subscale B; P = . 28) and avoidance (subscale CA; P = .57). In the zero component of the ZINBR model, CRP was a positive predictor of CAPS2: each 1-U increment in log10 plasma CRP concentration (ie, each 10-fold increase in CRP concentration) was associated with a fold change in the approximate odds of obtaining a CAPS2 score greater than zero (ie, odds ratio [OR] of nonzero CAPS2) of 1.51 (95% CI, 1.15-1.97; P = .003) (Table 2). Stated in the context of the range of CRP concentrations in our study population, a 1-SD increase in log10 CRP (corresponding to a 3.57-fold increase in CRP concentration) was associated with an OR of 1.25 (1.08-1.45) (Figure 1A). By comparison, 1-SD increases in CAPS0, CES, and PBE were associated with ORs of 4.15 (95% CI, 3.06-5.63; P < .001), 1.39 (1.06-1.83; P = .019), and 1.43 (1.13-1.80; P = .003), respectively. Consistent with the findings obtained with CRP treated as a continuous predictor, categorization of CRP revealed a trend toward a greater OR of nonzero outcome with increasing CRP category (although there was, as expected, a loss of statistical power) (Figure 1B). Likewise, CRP was a positive predictor of CAPS2 scores in the count component of the ZINBR model (which predicts approximately the extent of the outcome when it is nonzero, as described in the Supplement [eMethods]): each 10-fold increase in CRP concentration was associated with a 1.06-fold increase in CAPS2. However, this effect was statistically significant only at the trend level (95% CI, 0.99-1.14; P = .09 [2-tailed]) (Table 2). Accounting for the ranges in values of the predictors, a 1-SD increase in log10 CRP was associated with 1.03-fold change (95% CI, 1.00-1.07) in CAPS2; 1-SD increases in CAPS0, CES, and PBE were associated with fold changes of 1.36 (1.31-1.42; P < .001), 1.11 (1.05-1.18; P = .001), and 1.20 (1.13-1.28; P < .001), respectively (Figure 1B). In addition to analysis of the continuous outcome of CAPS2, we performed logistic regression of the categorical outcome of PTSD (DSM-IV-R definition 31) at visit 2 using the same covariates as in the ZINBR model. C-reactive protein was a significant predictor in this analysis as well, albeit not to as great a degree as in the ZINBR model: each 10-fold increment in CRP concentration was associated with a PTSD OR of 1.50 (95% CI, 1.02-2.22; P = .04) (Table 3). Taking into account the ranges of predictor values, a 1-SD increase in log10 CRP was associated with a PTSD OR of 1.25; by comparison, 1-SD increases in CAPS0, CES, and PBE were associated with ORs of 2.30, 1.43, and 1.35, respectively (Figure 2A). Conversely, adjusted baseline CRP values for participants with and without PTSD at visit 2 were 1.00 and 0.76 mg/L (to convert to nanomoles per liter, multiply by 9.524), respectively (adjusted for the same covariates as the logistic regression model) (Figure 2B). C-reactive protein was similarly a significant predictor in ordinal logistic regression of the diagnostic categories of PTSD, partial PTSD,32-34 or neither (P = .03) (Supplement [eResults, eTable, and eFigure]). We also performed subgroup analyses excluding participants at various thresholds of the model variables: plasma CRP, baseline CAPS, CES, and PBE. C-reactive protein effects in these subsets were generally similar to those obtained when considering all participants, indicating that the effects are not substantially influenced by individuals at the extremes of plasma CRP, baseline PTSD symptoms, or combat exposure (data not shown). Moreover, CRP was not significantly associated with baseline CAPS or PTSD diagnosis (P = .52 and .22, respectively), indicating that CRP is not a mediator or proxy for the effects of one of these other predictors on CAPS2. We report a significant effect of baseline CRP on postdeployment PTSD symptom emergence in Marine and Navy combatants, suggesting that higher levels of this inflammatory marker may be prospectively associated with risk for PTSD. C-reactive protein predominantly influenced the likelihood of participants demonstrating the presence vs absence of PTSD symptoms rather than the extent of symptoms when present (as indicated by its greater statistical significance in the zero model of the ZINBR vs the count and logistic regression models) and had a greater effect on the hyperarousal and numbing symptom clusters than on the other clusters. Conceivably, high CRP levels mark a state of vulnerability to developing these symptoms of PTSD, and the influences of other factors prevail in determining the severity of symptoms once they are manifested. It is sometimes postulated7,25-27 that the observed association between PTSD and peripheral inflammation is due to the former disorder predisposing to the latter, plausibly due to PTSD-induced dysregulation of the stress axis resulting in disinhibition of proinflammatory pathways. Our data raise the converse possibility—that individuals with lesser inflammation may be relatively resilient and those with greater inflammation relatively vulnerable to developing PTSD symptoms. This supposition is also supported by the recent finding that the risk for PTSD following medical illness during military deployment is comparable to that following physical injury.53,54 However, the possibility that higher CRP levels at baseline resulted from preceding trauma cannot be excluded. Nevertheless, the causal relationships between psychiatric disorders and inflammation are likely to be complex. For instance, in one recent large, prospective, population-based study, cumulative episodes of depression predicted subsequent CRP levels74 (although this effect was attenuated after controlling for body mass index and smoking, suggesting that it might be attributable in part to depression-related lifestyle changes rather than directly to the neurophysiological characteristics of depression). Moreover, with respect to PTSD, much work in animal models75-77 supports the conclusion that chronic stress induces immunologic changes that culminate in a proinflammatory phenotype. Thus, inflammation may both contribute to PTSD and be a consequence of the stressors that led to the disorder. Strengths of our study include its size, prospective design, and adjustment for multiple potential confounders. Moreover, owing to the youth of the study participants (mean age, 22.78 years) and their relative physical fitness (given the requirements for combat deployment), it is unlikely that chronic physical illness confounded the observed effects of baseline CRP on postdeployment PTSD symptoms. However, certain limitations merit discussion. The relative fitness of our cohort also limits the generalizability of our findings, as does the absence of women. In addition, whereas CRP concentrations fluctuate substantially in response to transient inflammatory states (eg, minor infections78), values in our participants were determined only once and thus may be relatively “noisy.” Moreover, use of anti-inflammatory medications, which might also have contributed to variability in CRP levels, was not ascertained in our study. However, such variability would generally be expected to bias toward the null hypothesis. Finally, with regard to missing data, 27.2% of the participants did not have determination of CAPS2 scores. However, CRP values did not differ significantly between individuals for whom CAPS2 scores were present vs absent; conversely, CAPS2 scores were not significantly different when comparing participants for whom CRP values were present vs absent (not shown). Moreover, we found the effect size of CRP on CAPS2 or PTSD diagnosis (the CRP-associated OR or fold change) to be generally similar across subsets of participants having markedly different mean values for the various covariates in our regression models (data not shown). This suggests that even if the individuals with missing data were considerably different from the other participants with regard to CES, PBE, or baseline CAPS scores, the CRP effect sizes that would have been obtained had the data not been missing are likely to be similar to those that were in fact observed. Taken together, these results suggest that missing data might not have appreciably biased our findings concerning CRP effects on PTSD symptoms. Our results, if validated by future studies, could have important clinical implications. If peripheral inflammation contributes to the development of PTSD, interventions to decrease inflammation, such as dietary or lifestyle modifications,79-81 might ameliorate the severity of this disorder. At minimum, our findings are consistent with the adage mens sana in corpore sano: a healthy mind in a healthy body. Submitted for Publication: July 2, 2013; final revision received September 21, 2013; accepted November 8, 2013. Corresponding Author: Dewleen G. Baker, MD, Veterans Affairs Center of Excellence for Stress and Mental Health, 3350 La Jolla Village Dr, Ste 116A, San Diego, CA 92161 (dgbaker@ucsd.edu). Published Online: February 26, 2014. doi:10.1001/jamapsychiatry.2013.4374. Author Contributions: Drs Nievergelt and Baker had full access to all the data in the study and take responsibility for the integrity of the data and the accuracy of the data analysis. Study concept and design: Eraly, Nievergelt, O’Connor, Baker. Acquisition of data: Nievergelt, Biswas, O’Connor, Baker. Analysis and interpretation of data: Eraly, Nievergelt, Maihofer, Barkauskas, Agorastos, Baker. Drafting of the manuscript: Eraly, Nievergelt, Baker. Statistical analysis: Eraly, Nievergelt, Maihofer, Barkauskas, Agorastos. Administrative, technical, or material support: Biswas, O’Connor. Funding/Support: Dr Eraly was funded by a UCSD Department of Medicine Career Award and by National Heart, Lung, and Blood Institute grant HL094728; Drs Nievergelt, O’Connor, Baker, and MRS personnel were supported by VA Health Service Research and Development Project Number SDR 09-0128, National Institutes of Health MH093500, the US Marine Corps, and the US Navy Bureau of Medicine and Surgery. Disclaimer: The content is solely the responsibility of the authors and does not necessarily represent the official views of the federal government. Additional Contributions: Michael G. Ziegler, MD (Department of Medicine, UCSD), Deborah L. Wingard, PhD (Department of Family and Preventative Medicine, UCSD), Felix K. Yam, PharmD (School of Pharmacy, UCSD), and Florin Vaida, PhD (Department of Family and Preventative Medicine, UCSD) participated in helpful discussions. We thank the Marine and Navy Corpsmen volunteers for their military service and participation in this study.